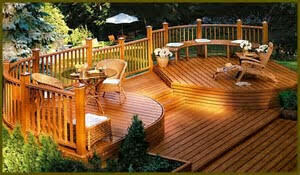 A common addition or remodel that a person makes to their home is decking. Who doesn’t love a beautiful deck? It is the perfect place to spend time during warm evenings when the barbeque is out, and conversation with friends or family are to be had. Now, there are plenty of companies out there who would love to help you build your deck. Similarly, there are lots of videos on You Tube instructing people how to do it yourself. There is no wrong choice when it comes to deciding whether to have your deck built professionally or built lovingly by yourself (although beware the You Tube videos), but there are some things to consider when taking on the project of adding or remodeling your home’s deck. For example, what function do you want your deck to provide? This may sound like a stupid question, but hear me out. Taking a minute to think out about what you want to use your deck for could save you some money (or cost you more depending on how grand your ideas are). Where on your home will the deck connect to? Part of installing decking attached to the home may include removing some siding and or adding flashing to any portion that touches the home. So how large or long you want your deck to be can be impacted by this. Are you planning on having any special features on your deck, such as built in benches, planters, do you want to build it around a tree or a hot tub/pool? How many levels would you like to be? Does it need to be accessible only at ground level or to a second floor? Once you figure out how you plan to use your deck, it will give you a better idea as to what materials you are going to need, sizing, and amount of labor required. One of the most important questions to ask yourself before you begin the decking process, and I apologize for not listing it first (but seriously, how much more fun is it to imagine what kind of deck you need for your Traeger?) is, will I need a building permit? I took a minute to look up Oregon building code, and the answer, is, maybe. According to this fun pamphlet I found through the county site, a permit is required when one is “building or replacing a deck more than 30 inches above adjacent grade, measured at any point within 3 feet horizontally of the deck.” So if you plan on doing this, then yes, you will need a permit so save some time and heartache by getting this before starting. Other information I found through the state regarding decking includes this bit of wisdom: “All wood in contact with the ground, embedded in concrete in direct contact with the ground or embedded in concrete exposed to the weather that supports permanent structures shall be approved pressure preservative treated wood suitable for ground contact use.” While this would seem like a no brainer, it is always nice to have official confirmation. Pressure treated wood, check! So what are some of the best woods to use for decking? Ipe, a Southern American hardwood, has received top marks from the USDA Forest Service Products Laboratory for bug-and rot-resistance. In fact the wood is so hard, it is nearly as difficult to burn as concrete (please don’t try that at home). The downside is it is from the rainforest, so when choosing this wood, be extra careful that it has the trademark that ensures that the wood was harvested responsibly. In contrast, Western Red Cedar is a soft wood that splinters easily, but stands up well to the rain, cold, sun, and heat. It is a beautiful color that ages to a silver gray, and possesses increased durability when properly stained. Redwood is fairly similar to the Western Cedar in its coloring when aged, and is also a soft wood. When in prolonged moisture it will blacken, but when sealed well it will be more attractive. Redwood will do well in rot resistance. Mahogany is a fun wood that looks like teak when treated with Marine oil or it will also age into that silvery gray. It holds up well in the pest and rot resistant categories, and has a lot of different varieties to choose from. However, Mahogany is also one of those woods that you want to ensure was harvested properly, so if you choose this wood, look for the FSC trademark. Alternatively, you could go with a mock lumber, made of synthetic materials. The downside (if you consider it so) is that it is imitation. The benefits are that it is virtually pest- and rot-proof. A lot to consider when building a deck! We haven’t even talked about what kinds of sealers or stains to use, but that may be a conversation for another time. Once you know what you want the size and function of your deck to be, your county or state’s building codes or permit requirements regarding decking, and the type of materials you want to use, you are onto the build! Whether you choose to use a professional decking company or attack the project on your own, you are on your way to having a new and improved deck! Have you built your own deck before? If so, what wood did you choose? How was your experience?